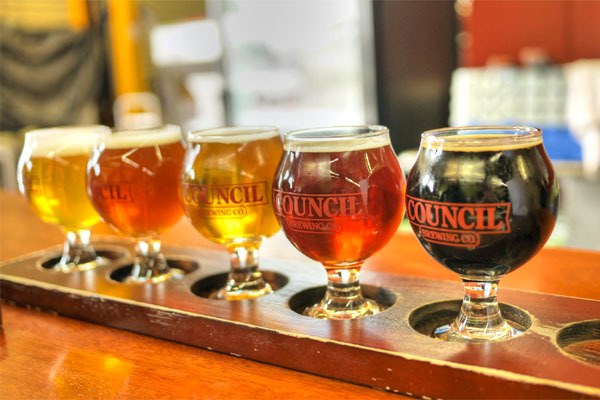 After hitting up four breweries the previous day, we went for another quartet, starting with Council. Founded in 2013 by Liz and Curtis Chism (Liz serves as head brewer) as well as CFO Greg Leiser, the operation opened in 2014 in the Kearny Mesa neighborhood with a particular focus on both West Coast-style IPAs and sours. 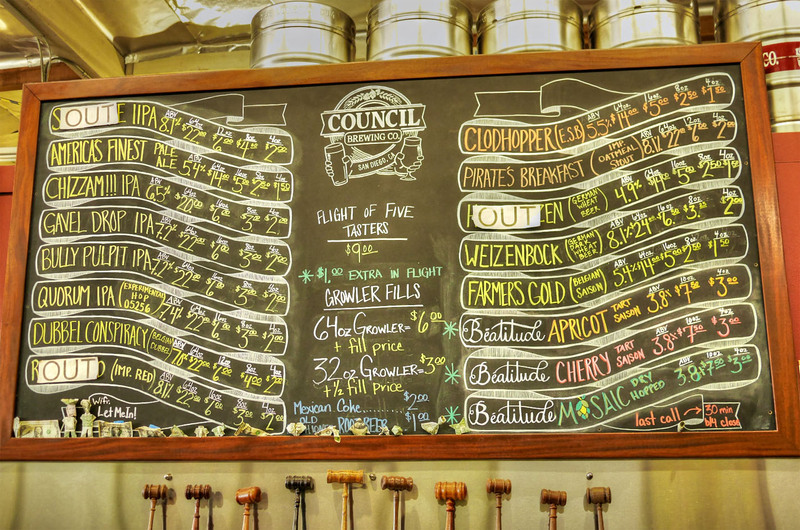 Council's tasting room is compact, but inviting. 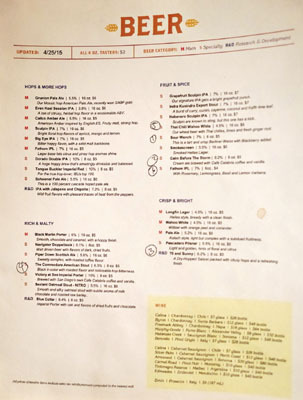 Sixteen taps are generally available. Click for a larger version. Farmer's Gold / Belgian Saison [$1.50]: Bright green apple to begin, with Belgian-y yeast, grain, and spice to round things out. Dubbel Conspiracy / Belgian Dubbel [$2]: Light smoke on the bouquet, along with a subtle sweetness; on the tongue, it was all about malt, with some dark fruit and tartness. Beatitude Mosaic / Dry Hopped [$3]: My favorite of the Beatitudes, lemony and herby on the nose, with more tart, dry, refreshing lemon on the palate, all underscored by a wonderful hoppy bitterness that was perfectly integrated. Beatitude Apricot / Tart Saison [$3]: Smelled of sour stone fruit, while the taste went earthy, with the apricot coming in strong toward the rear. Beatitude Cherry / Tart Saison [$3]: A good amount of tart cherry on this one, the fruit flavors only intensifying toward the finish. Bully Pulpit IPA [$2]: Super hoppy, resinous, bracingly so, with a sweetness creeping in toward the mid palate. Clodhopper / E.S.B. [$1.50]: Extra nutty and almost savory in terms of aroma; again, nutty, malty, and softly bitter on the palate. Quorum IPA / Experimental Hop 05256 [$2]: Quorum represents a series of experimental IPAs, and this particular batch was just about the dankest IPA I've had, almost disconcertingly so in fact. Not a fan. Weizenbock / German Dark Wheat Beer [$2]: Classic weizenbock notes of malt, dark fruit, and subtle spice. Pirate's Breakfast / Imperial Oatmeal Stout [$2]: Smooth, with apparent nuances of coffee, roast, and a bit of dark fruit. We'd initially come here to pick up bottles of Vienne, a barrel-aged biere de mars that we'd purchased earlier online. 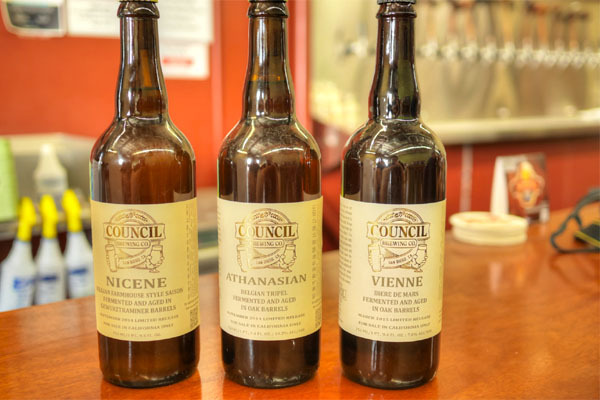 However, the brewery had run out somehow, so we were instead provided with bottles of Council's previous barrel-aged releases: Nicene, a Belgian farmhouse style sour saison, and Athanasian, a barrel-aged Belgian tripel. If that wasn't enough, we happened to run into Curtis in the tasting room, and he was kind enough to toss in a free bottle of Bourbon Barrel Aged Pirate's Breakfast as well, which he cautioned was infected (my plan is to just let it age, and see what happens). 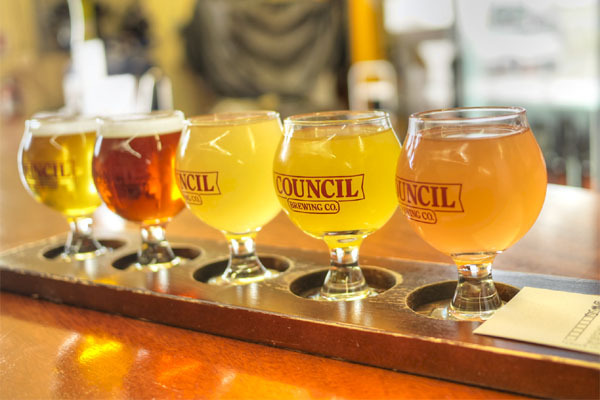 Council's another SD area brewery that I'm pretty excited about, particularly when it comes to their sours and barrel-aged releases. 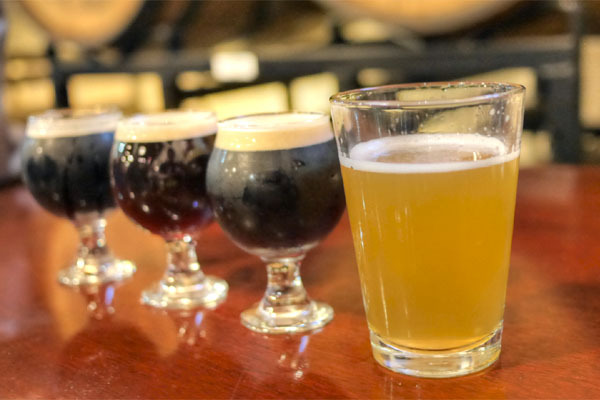 In fact, I've already purchased their fifth and sixth BA beers, the House Red and House White, a duet of wine grape sours brewed for Council's first anniversary. Looking forward to seeing what they come up with next. 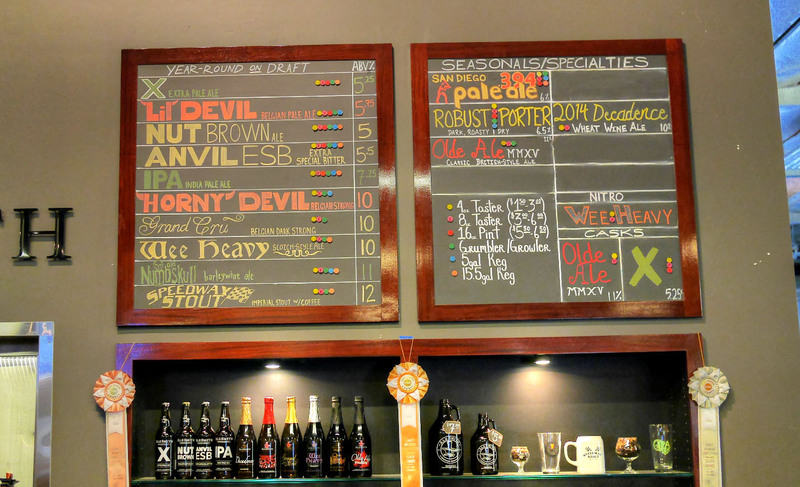 From Council, our next stop was the nearby Societe Brewing, which I'd been hearing a lot about in recent times. Opened in May 2012, the brewery is the work of Douglas Constantiner and Travis Smith, two friends who first met while working at The Bruery. Spanning roughly 3,000 square-feet, Societe's tasting room is one of the nicer ones I've encountered, with lots of sitting space and a nice view of the entire operation. 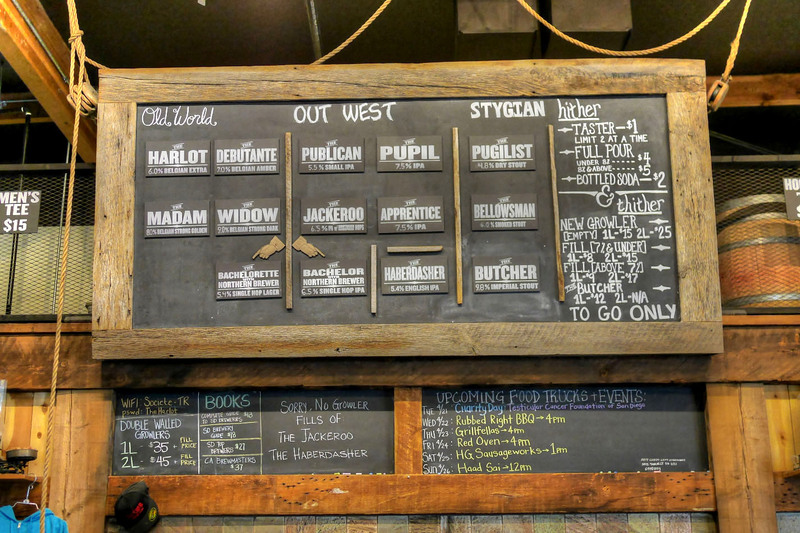 Here we see the tap list, which is divided into three sections: Old World (Belgian-ish), Out West (West Coast-y hoppier stuff), and Stygian (dark and roasty). Click for a larger version. The Harlot / Belgian Extra: Light and grainy notes abound; a subtle fruit/floral character to taste, along with a smidge of spice and hops. The Debutante / Belgian Amber: Slight aromas of tartness, grain, and hops, transitioning to a malty flavor profile with a hint of yeast. The Bachelorette with Northern Brewer / Single Hop Lager: Very light on the nose, with hints of lemon peeping up; on the palate: crisp, refreshing, grainy, softly bitter. The Bachelor with Northern Brewer / Single Hop IPA: Again, lemon-y both in terms of smell and taste; tarter than The Bachelorette, with a nice amount of maltiness. The Madam / Belgian Strong Golden: Tart, yet somewhat fruity for the bouquet; yeasty, a bit sweet-n-sour on the tongue. The Widow / Belgian Strong Dark: Smells of light malt, caramel, with slight fruit; taste largely follows, with notes of caramel, roast, and mild astringency. The Haberdasher / English IPA: Very weak on the nose; bitter at its core, but tempered by a restrained malt profile. The Bellowsman / Smoked Stout: Classic stout aromas, leading to an abundance of roast, malt, and cacao, the smoke coming through more on the close. 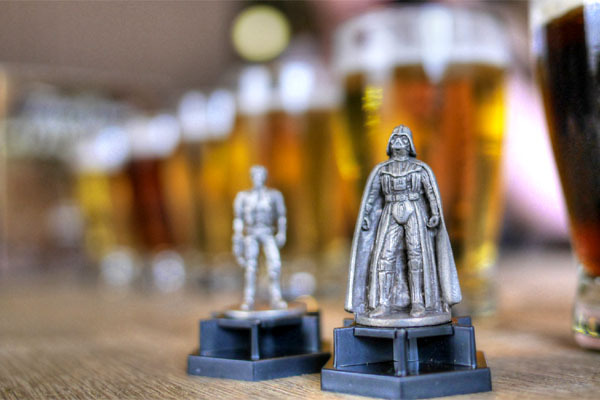 One of the benefits of Societe's tasting room is the abundance of board games. Someone, I managed to win a game of Stars Wars Trivial Pursuit, despite not knowing much about either Stars Wars or Trivial Pursuit. I'd heard a lot of great things about Societe coming in, but I left a bit underwhelmed. 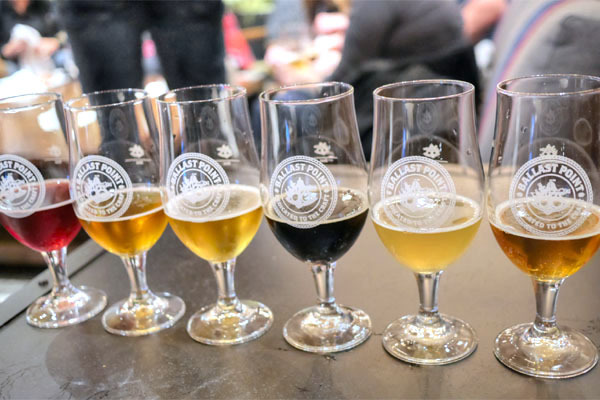 The beers are well made, but I think the issue was that stylistically, they just weren't up my alley: nothing barrel-aged, nothing funky, nothing sour, nothing really experimental. However, I know they're working on a Feral line of wine-barrel aged sours, so I'll be looking forward to trying those out. We then proceeded north to one of the biggest names in SD brewing. 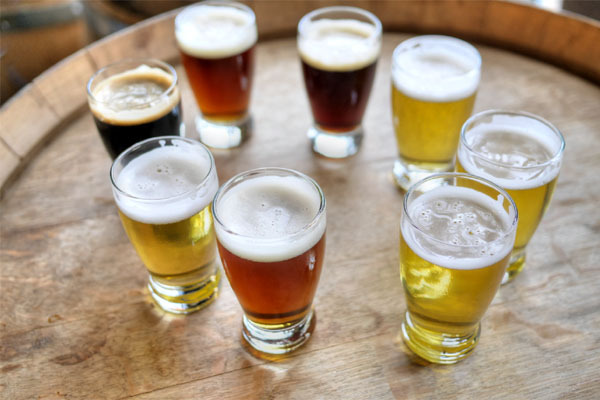 AleSmith was founded back in 1995 by Skip Virgilio and Ted Newcomb, but really began to take off after brewmaster Peter Zien purchased the company in 2002. The brewery specializes in European-inspired ales, and is especially well-regarded for its barrel-aged brews. 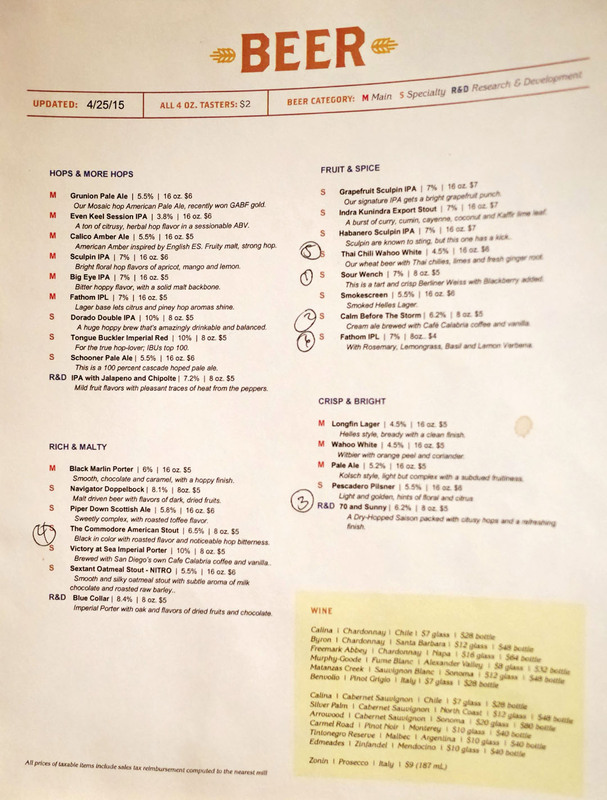 The tap list is fairly compact, with AleSmith's year-round beers joined by some more uncommon selections, including stuff on cask/nitro. Click for a larger version. Robust Porter: Coffee, bitterness on the nose; dry, roasty body, but not too hefty. Olde Ale MMXV on Cask: Smells of massive amounts of malt and dark fruit; tastes follows smell, with slight hops. Wee Heavy on Nitro: Super creamy and unabashedly boozy, with notes of dark fruit, sweet malt, roast. X on Cask: Hoppy, juicy aromas; tastes hoppy, yet smooth, with a dark, malty quality to even things out. The beers were pretty on point across the board, but we didn't really want to spend too much time here given how cramped the whole place was. The tasting room is far too small given the popularity of the brewery. Fortunately, AleSmith is expanding into a much larger facility less than a mile away in the coming months. I'll be looking forward to a revisit. We ended the day at Ballast Point, the only brewery of the lot that could challenge Stone in size and scale (in fact, production-wise, it's #2 behind Stone). The history of Ballast Point starts with one Jack White, who first started brewing with roommate Pete A'Hearn during their days at UCLA. White eventually opened Home Brew Mart in San Diego in 1992, while A'Hearn went to UC Davis and earned his brewer's credentials. The two then teamed up with home brewer Yuseff Cherney and started Ballast Point in the back of Home Brew Mart in 1996, though A'Hearn left the team soon after to become a science teacher. A larger production facility was opened in Scripps Ranch in 2004, and in 2008, Ballast Point began distilling at that location. 2013 saw the debut of a brewery-restaurant in Little Italy, while last summer, the Miramar location that we see here dropped. The space is indeed impressive, spanning over 100,000 square-feet and housing production facilities, a large tasting area, and a full-blown restaurant to boot. 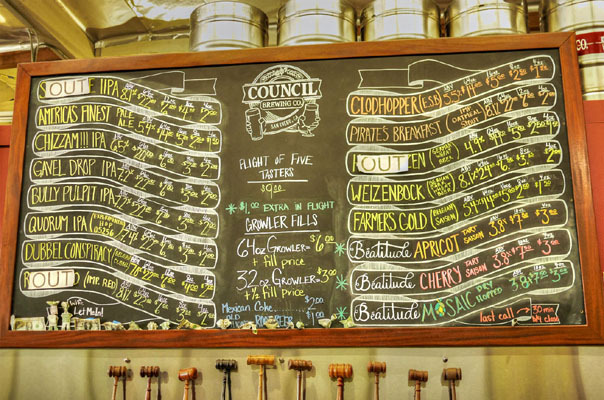 Here we see the list of beers on draft (including some of BP's more uncommon selections), with tasters going for two bucks a shot. Click for a larger version. Sour Wench: A dry, tart, crisp Berliner Weisse with a lovely overarching Marion blackberry character. Calm Before The Storm: A cream ale brewed with Café Calabria coffee and vanilla, this one was fetching, a silky explosion of smooth coffee and vanilla flavors. 70 and Sunny: A dry-hopped saison; light bitterness and earthiness in the aroma; hoppy and refreshing on the palate, with subtle citrus. The Commodore American Stout: Sort of a prototypical stout, roasty with coffee notes and a strong hop bite. Thai Chili Wahoo White: Wheat beer with Thai chilies, limes, and ginger; restrained heat on the nose; more spice hits the tongue, joined by lime tartness and an underpinning of ginger-y zest. Fathom IPL: India pale lager with rosemary, lemongrass, basil, and lemon verbena; a nice twist on the base beer, with some delightfully floral, herbaceous aromatics. I was pleasant surprised with Ballast Point. Certainly, the space hits all the right notes, but the beer itself was much more interesting than I was expecting from the brewery. It'd be nice to see their more adventurous beers in bottled form. aw man you missed the very best beer at Societe. Their Pupil IPA might be top 3 IPAs in California right now. If you go to the Miramar Ballast Point they do a lot of "research/homework" series which are awesome fruit/spice based beers.